Equipped with a new powerful sound engine, including a professional Stereo Grand Piano sound over 88 notes, huge Orchestral voices such as Saxophones, Brass, Woodwinds, Guitars, Accordions, Organ Digital Drawbars and many others, the SD2 has all the latest features for recording, programming and live performances. 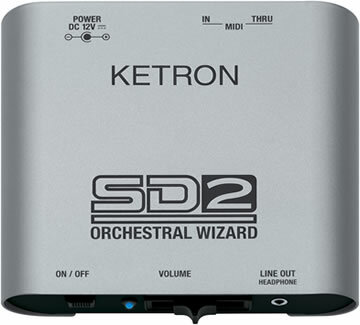 The quality of the Solo instrumental Voices (following the traditional KETRON Best Natural sound heritage) is a remarkable advantage of the SD2. Sound Generation Stereo Grand Piano.384 GM Voices. 128 Special Orchestral Presets. Over 1000 Percussive sounds. Drum 1 32 New Drum sets. Drum 2 150 Live Drums, featuring Acoustic, Jazz, Pop and Dance Loops. Effects Multi effect DSP. Reverb, Chorus, Delay, Distortion, Rotor Slow/Fast. MIDI In, Thru. 32 Midi Channels. GM standard. Outputs Left & Right Outputs . Stereo headphone. Dimensions L x W x H = (12 x 13 x 4 cms.) (4.8 x 5.2x 1.6 inches). Power External 12 Volts Power supply. 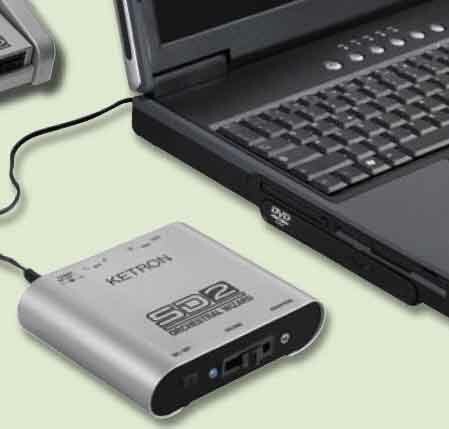 Options USB to Midi cable.